same rules apply, champ. nothing to see here. I really enjoyed making this hat — Malabrigo is particularly squishy in this k4,p4 rib pattern, and the way the decreases are incorporated into the ribbing so that the rib columns narrow to nothing looks fantastic. 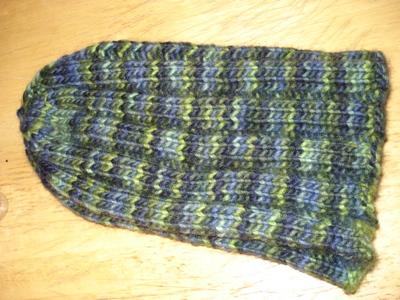 (Pattern: The Boy Hat. Yarn: Malabrigo Merino Worsted. Needles: US 7.) Here is a picture of the hat unstretched. Apologies for the awkward camera angles. I love this hat. I might need one. 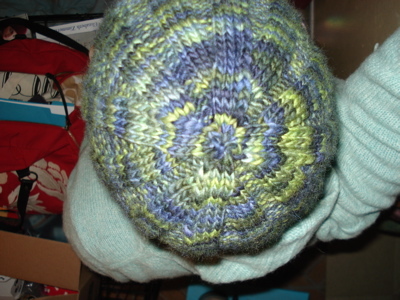 This entry was posted in knitting and tagged FO, knitting, malabrigo, ribbing, the boy hat by barefootrooster. Bookmark the permalink. Very nice! That was a quick knit.